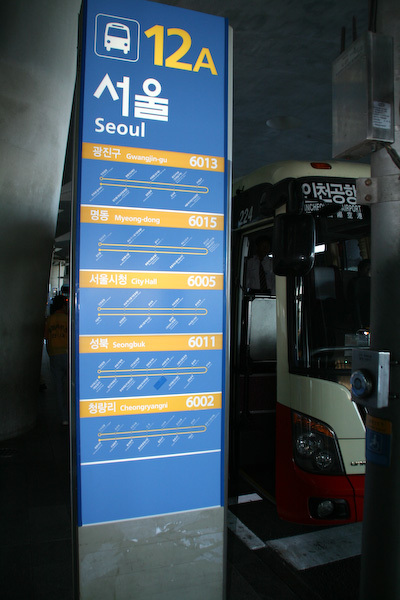 There are many ways to get from the Seoul Incheon International Airport, and more are even coming with a subway line being built that will connect the Airport all the way to downtown. The airport is actually quite a distance from downtown – it takes about an hour and a half to 2 hours. However, there are many airport buses that lead to almost anywhere you want to go in the city, they are very comfortable (with lots of space for luggage), and it is easy to figure out where to go – even after stepping off a long international flight. We were going to Insadong-il, and there was a stop that dropped us a 10 minute walk from our hostel. 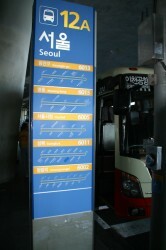 There are easy to read schedules, and English-speaking people at the airport to help you out.